Well, yesterday, Birmingham Bill forecast six more weeks of winter, and I am afraid he might be right, with it looking colder after our brief early February thaw of this week. But for now, let’s just enjoy! We’re starting off the day cloudy today, thanks to a passing upper-level disturbance and slug of moisture. But the clouds should give way grudgingly to sunshine as we go through the day and afternoon temperatures will warm into the middle 60s. Tonight will be mild with lows in the upper 40s and lower 50s. A deeper wave of moisture will be pushing across Mississippi and into Alabama by early Monday morning. This will be the theme as we go through the week ahead, with higher moisture levels and plenty of warmth through mid-week. Monday will be showery, with clouds and rain at times. It won’t rain all day, or very much at any one location, but it will feel like a rainy day. Highs will still reach the 60s. There could be a little patchy fog early. Tuesday will partly sunny and warmer. Highs will reach the lower 70s. There will be a few showers, and I wouldn’t count out the chance of a little thunder as well. But nothing to write home about as far as potential storminess goes. This could be the best day of the week. The front continues to lift northward which will allow for even more warm air to be pulled into the area on Thursday. We’ll have a slight chance of a few scattered showers with the higher chances over the northern half of the area. Highs will be in the mid to upper 70s. A cold front will approach the area late Thursday night and pass through the area during the day on Friday. Highs will be relegated to the 50s again. Expect 30s Friday night. It looks like another protracted wet weather system will affect Alabama around the 18th and 19th. Heavy rainfall amounts could be in the offing again for Alabama and the Deep South. What is the greatest song of your generation? The song that made you think, or was an instrument of change? The song that defined a time period? For many, it was a song that was born out an event that was caused by bad weather on this date back in 1959. More on the story at AlabamaWX.com later this morning. 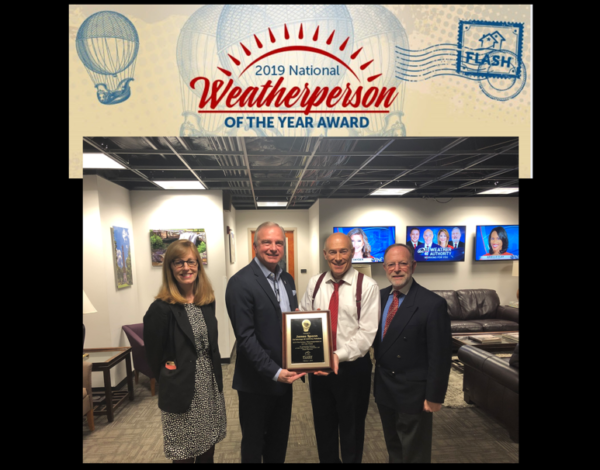 Congratulations to James for winning the National Weatherperson of the Year Award from the Federal Alliance for Safe Homes! Join us tomorrow night on WeatherBrains as Leslie Chapman Henderson checks in to congratulate him virtually in person. Here was the scene Friday night as James received the award in a surprise ceremony at ABC3340.